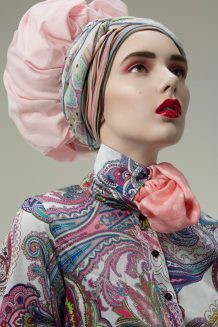 Alla in Paisley, vivid stripes, bold colours and classic shapes for a “funtastic”, “turbalicious” and “turbanastic” beauty story shoot by Margarita Rum. We are pleased to share the publication of the winning images of the Benjamin Kanarek Blog-WestEast Fashion & Beauty Photography Contest in the Summer issue of WestEast Magazine that just come out and now available on newsstands. If you have a Fashion or Beauty Photography Editorial that you feel you wish to have featured here, please feel free to send it off to us, with all of the team and clothing credits to info@benjaminkanarekblog.com.